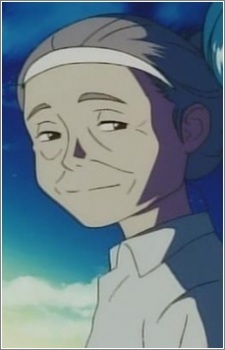 An elderly woman, Sensei is a doctor for both humans and androids. She was involved in the development of the A7 series of robots and hosted Director Alpha at her home, possibly as Director Alpha's owner. When she was younger, she rode motorcycles, raced hovercraft, and was Ojisan's senpai from school. Her surname is Koumi'ishi (子海石, Koumi'ishi , lit. "child-sea-stone") but she is always addressed by just her title. Besides the pendant with her logo, both Alphas appear inherit her vision of "going and seeing".